I’ve made this graphic for the book “We are many, they are few: Call out for movement stories Reflections on Movement Strategy from Occupation to Liberation” (AK Press) to be included with the article about the General Demographic and Participation Survey, research by and for the Movement: Key Findings From the Occupy Research General Demographic & Participation Survey (ORGS) by Christine Schweidler, Pablo Rey Mazón, Saba Waheed and Sasha Costanza-Chock, for Occupy Research and DataCenter. 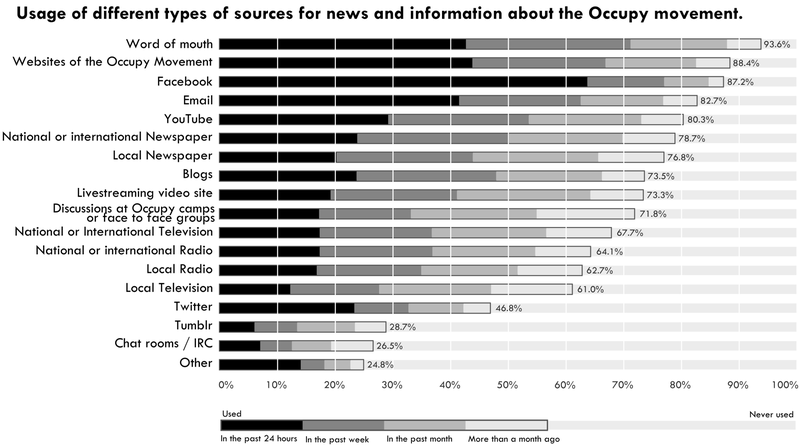 It’s counter-intuitive to see how Twitter is not the among the main sources of information . We’ll have to dive deeper in the data and see which kind of people were the more heavy users. Take in account that the “sample of respondents was non-random: therefore, our findings cannot be assumed to reflect all participants in the Occupy movement”.